Omega-3 fatty acids are essential for proper eye and brain development in children, and for learning and behaviour. Unfortunately, many children are chronically deficient in these essential fats due to low dietary intake of fish and fish oils. Omega-3 deficiency is linked to learning disabilities such as attention deficit disorder (ADD), and immune reactions such as allergies and eczema. 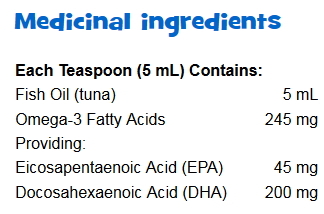 Omega-3 DHA (docosahexaenoic acid) is highly concentrated in the brain and eyes and is recognized as important for brain, visual, and nervous system health and development. Research shows that children who receive a daily supplement of omega-3 from fish oil that is high in DHA have improved attention, behaviour, and success in school. An omega-3 supplement is an important nutrient for growing bodies and minds. 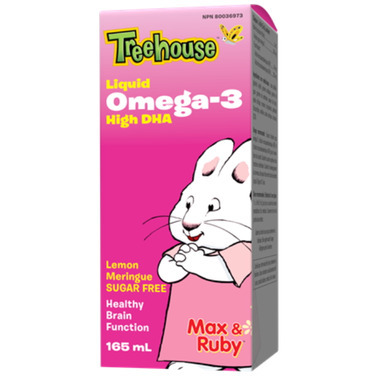 Treehouse Omega-3 Liquid provides a convenient alternative for children who cannot swallow capsules. The liquid is emulsified to prevent fishy after taste and has a naturally sweetened lemon meringue flavour your kids will enjoy. It is formulated to be high in DHA (an important omega-3 fatty acid) for building healthy cells in the nervous system and for optimal nutrition. Treehouse Omega 3 is the only taste I can slip into my 7 year old's juice. She is special needs and the high DHA has made a significant improvement on her mental abilities. Both of my kids love the taste of this and it is not a fight to get them to take it every day. It is quite viscous so it is easy to measure out. My child loves this product and takes it every day. Highly recommended. Kids love it. They take it every night without any issues. Kids also have food allergies and no reactions from taking this supplement.